Vascular dementia is a cause of dementia. It is caused by disease of the small blood vessels in the brain. Parts of the brain called white matter (as well as subcortical grey matter) are injured by multiple small strokes. Vascular dementia occurs when cells below the surface of the brain (the cortex) receive an inadequate supply of oxygen and nutrients and, in turn, die. 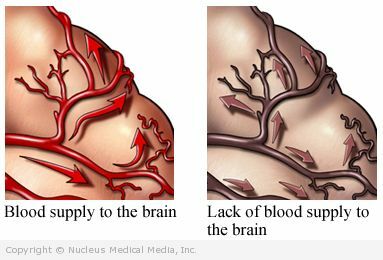 This process is due to hardening of the blood vessels within the white matter of the brain, which affects the blood supply. As a result, the oxygen and nutrient supply to the neurons and their supporting cells are also affected. In some patients, symptoms appear suddenly with neurologic changes like those caused by a stroke. Sometimes, the small strokes that lead to vascular dementia can happen without other symptoms. This makes the condition difficult to detect. In some cases, symptoms may stabilize or even improve. However, in most patients, the disease continues to progress. The symptoms of vascular dementia can resemble other causes of dementia, such as Alzheimer’s disease. There is no known cure for vascular dementia. Minimizing risk factors and alleviating symptoms are important in trying to slow disease progression and improve quality of life. Eat a diet that is low in fat and low in salt. If you drink alcohol, do so only in moderation. Moderate alcohol intake is two drinks per day for men; one drink per day for women. Have your blood pressure and blood cholesterol levels checked regularly (at least once per year). Avoid low blood pressure. If you get dizzy when you stand up or have a history of fainting, talk to your doctor.